Since 1950, White’s Electronics has been building the highest quality and performing metal detectors on the market. Every one of them are built by American workers in Sweet Home, Oregon. We now sale them here online. Or if you would like a hands on demonstration come by our store, we will be glad to help you decide which White’s Detector is right for you. 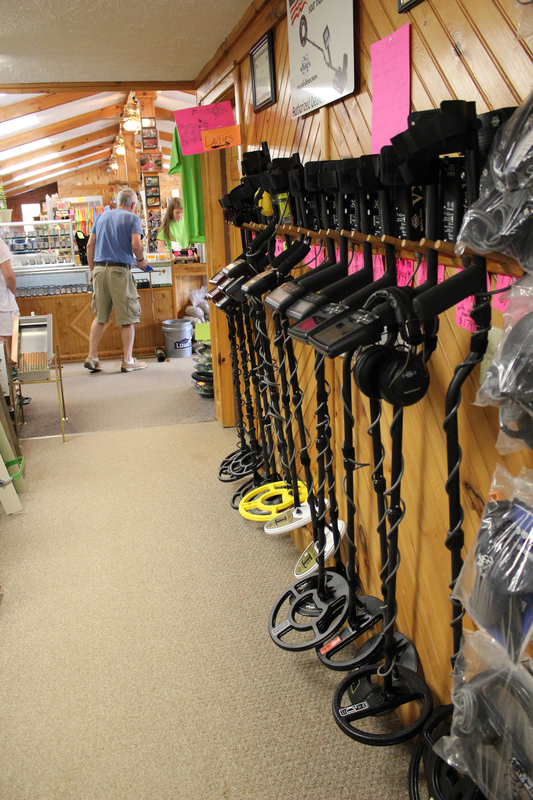 So, if you’re in the market for a metal detector, look no further than White’s. Come by the shop and try one out! Click Here to Get Shopping! Metal detecting is an fun activity for beginners to enjoy as an adventure, hobby, or way to relax. Once armed with your detector of choice, just step outside! Metal detecting in a yard can yield surprising treasure. The biggest misconception among new detectorists is thinking they have to go somewhere exotic to start hunting for treasures. You’ll be amazed at what you might find right outside your front door. Wherever people have been, items have been lost and now are just waiting to be discovered. Your own turf will let you get to know your detector and its settings, maybe even finding something along the way. When you’re comfortable, it’s time to step out into the neighborhood. You might be surprised what you discover, even in urban and residential areas. You can benefit from others’ wisdom in any area of life, and metal detecting is no different. Finding a local treasure hunting club is a great way to learn from seasoned local pros. Even better than advice is the company of those who also enjoy the hunt and thrill of discovery. Just like with fishing, these folks will know some good spots, tell a few tall tales, and make the journey more fun. You might find yourself seeking farther places to hunt, or packing your detector for vacations, but this hobby also fits into your regular life. Nearby beaches are given a new bounty by each passing storm, and grassy strips next to sidewalks prove surprisingly rich in lost artifacts. You’ll find excitement while metal detecting, and the adventures fit easily around your life and location.